These days ‘Festive mood’ is in full swing! Eid is gone, Janmashtami is gone, Dahi Handi has just passed and Ganesh Chaturthi is already knocking on the door. And all Indian festivals are meant to be celebrated with loads of food; specially snacks and yummy desserts. I promised you guys to share at least one special recipe for each celebration. In my previous post I shared the recipe of BananaFritters or Bengali Kolar Bora which is one of the must things on Krishna Janmashtami occasion. Today I’ll share my experience on Dahi Handi and a fusion dessert Coffee Semolina Cup with Chocolate Ganache. 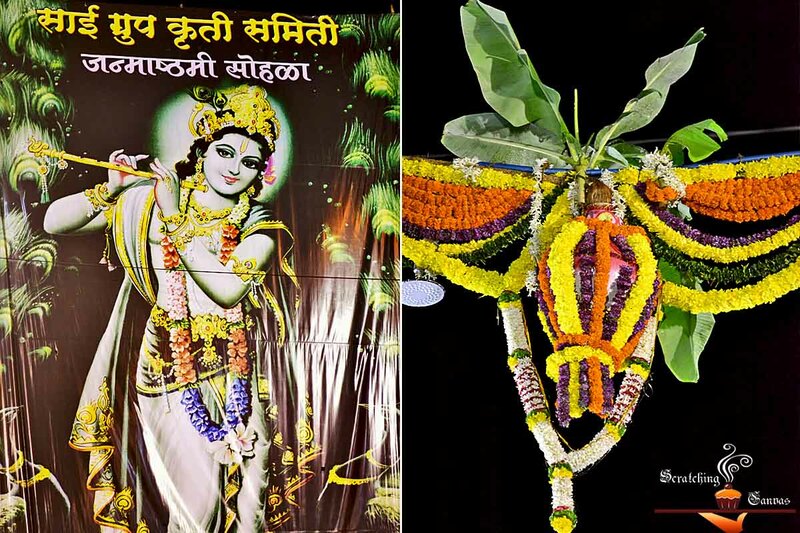 I had already told you about the celebration Krishna Janmashtami. 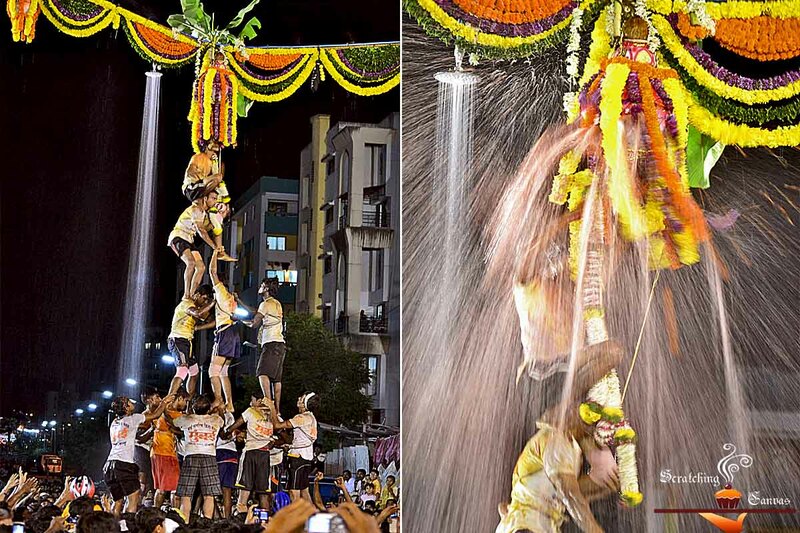 What I didn’t explain is the exciting part of Dahi Handi. It’s an interesting sport on Janmashtami which attracts me most (apart from the food) which is also known as Govinda Sport. A buttermilk filled clay pot is hung high in the middle of streets and the top most person of a human pyramid tries to break the pot. These guys are known as Govindas who take part in this sport. Whichever group can crack the pot and get the buttermilk all over them, they are declared as the winner. It may sound simple to you but trust me they are not. Though it is a super fun to me to watch but damn dangerous to those ‘govinda’s. Usually the clay pots are hung at a height of 50-60 ft. from the ground; even more sometimes. And around 50-60 people are required to make the pyramid to reach the clay pot. Don’t believe me? See the snaps below which I took during the celebration around my place. How can we digest so many stories about the celebration without the special food?? Here is today’s star dish Coffee Semolina Cup with Chocolate Ganache. 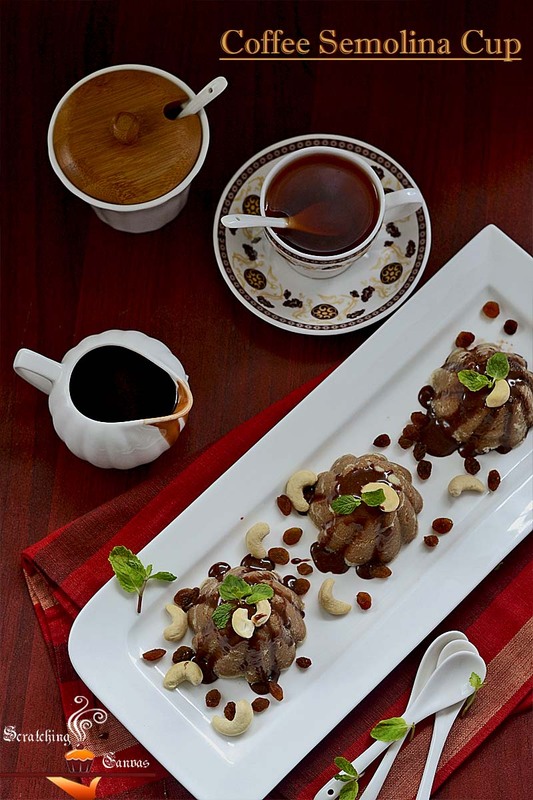 This dessert is a recreation of simple semolina halva (or halwa) with coffee and chocolate sauce on top. 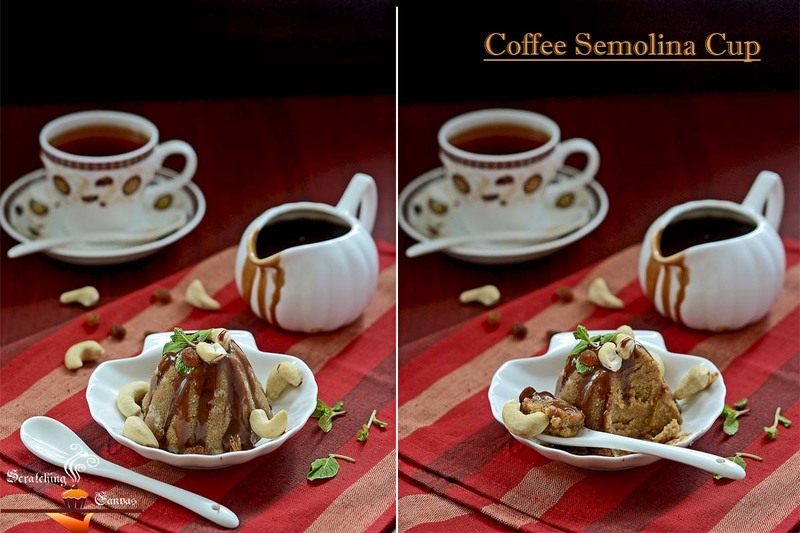 Semolina halva is a popular milk based dessert where roasted semolina is cooked in heavy milk with sweetener and often topped with dry fruits. I mixed generous amount of coffee with the milk and molded them in cups. And satisfying amount of chocolate ganache on the top was enough to put a large smile on Bhatty’s face. Take 2 tbsp of butter or clarified butter in the wok and heat it on medium flame until melts. 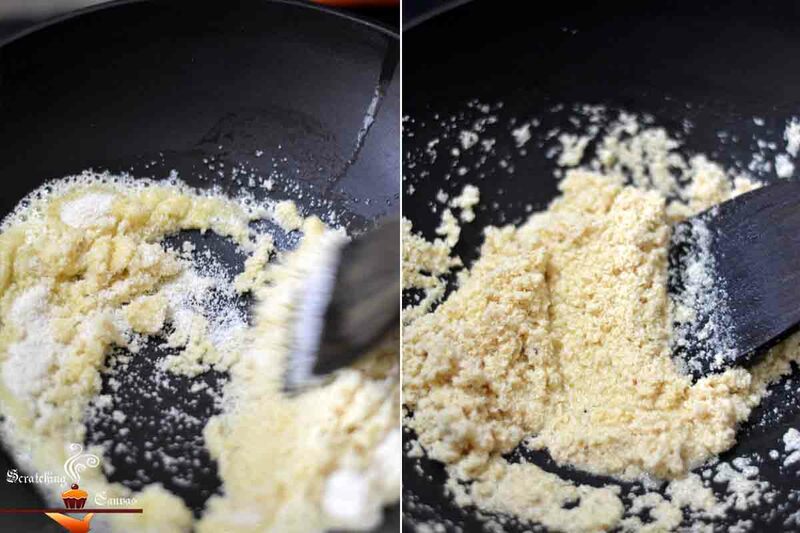 Add semolina in the hot butter/clarified butter and stir continuously to avoid lumps. Roast the semolina on medium low flame and stir continuously. Soon you will notice the color of semolina is changing and it’s turning to golden brown. Be careful not to burn. Keep an eye on it as it has the tendency to burn quickly. 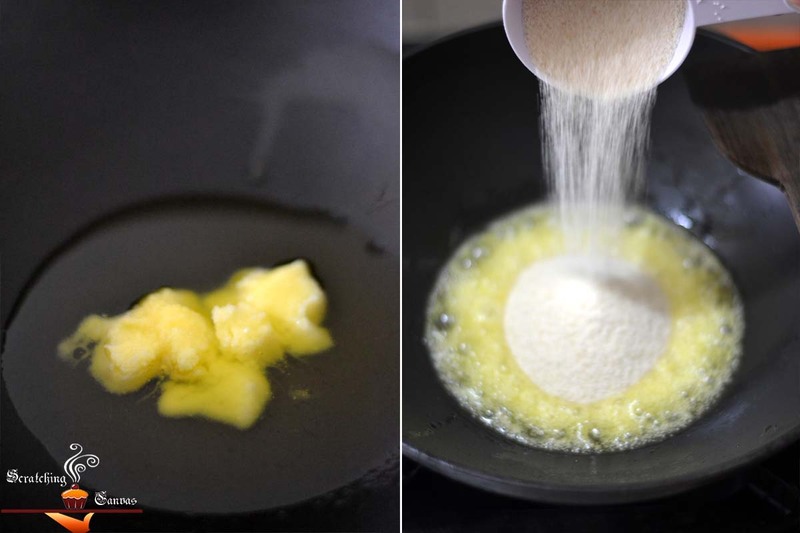 When the semolina is colored evenly, pour the condensed milk in it and stir continuously. Allow to cook it for 1 min on low flame. In the meanwhile, let’s prepare the coffee. 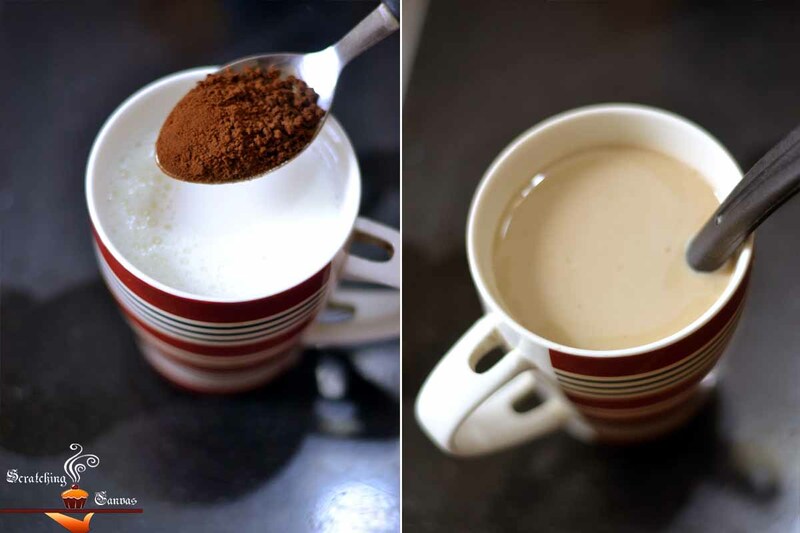 Take 3-4 tbsp of milk in a cup and mix coffee in it to form a thick paste. Make sure there are no lumps at all. 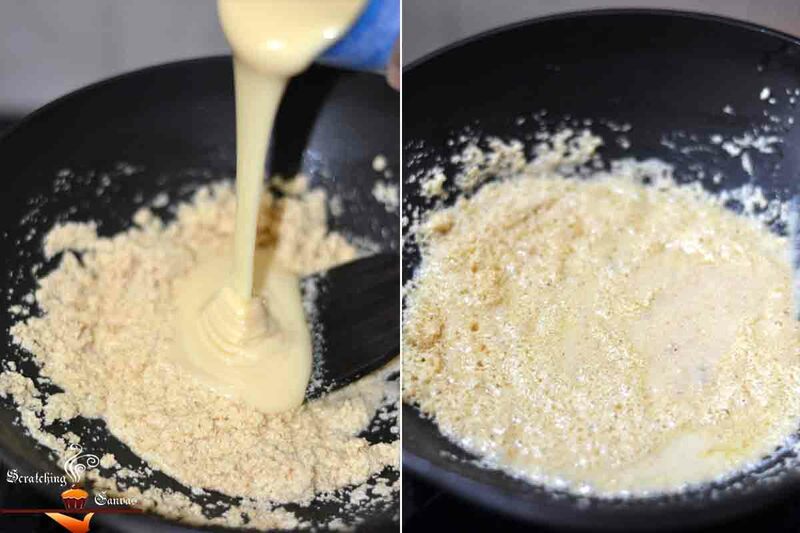 Once the paste if completely lump free add rest of the milk and mix well. 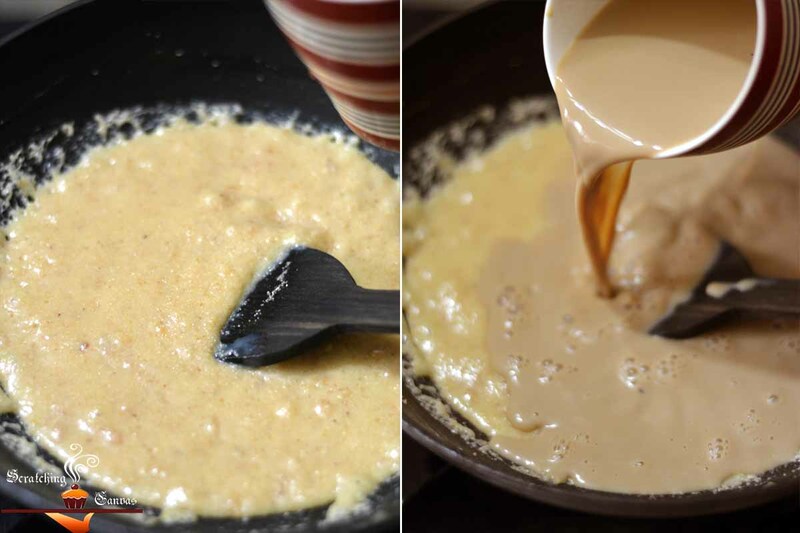 Pour half of this coffee mixture straight into the semolina condensed milk mixture and cook on medium flame for 1-2 mins. Stir the mixture continuously. Once the mixture starts thickening add rest of the coffee mixture into the wok. Allow it to cook on medium flame for 2-3 mins more. Again the mixture will start thickening. Now turn the flame to medium high and stir continuously. Within a minute the mixture will start leaving the wok. At this point of cooking the semolina will look like a lump. 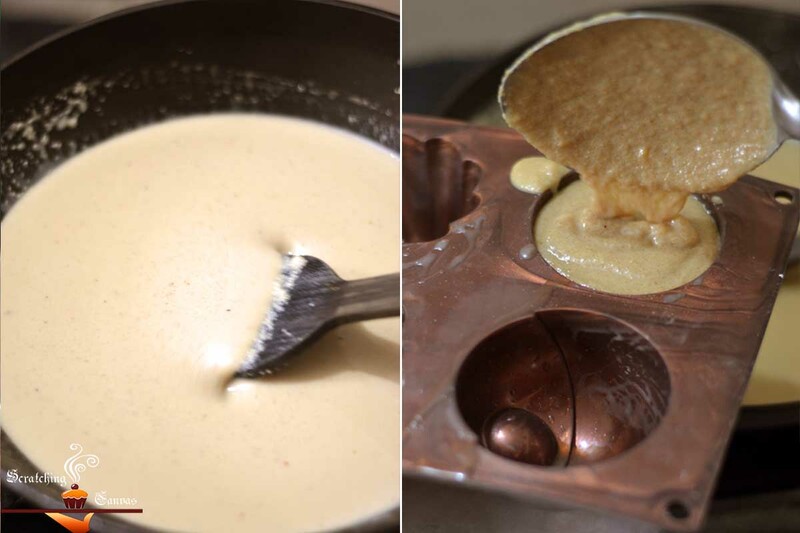 Switch off the flame and immediately transfer the mixture into previously greased (with butter/clarified butter) molds. Keep the molds in wire racks and allow them to cool completely. 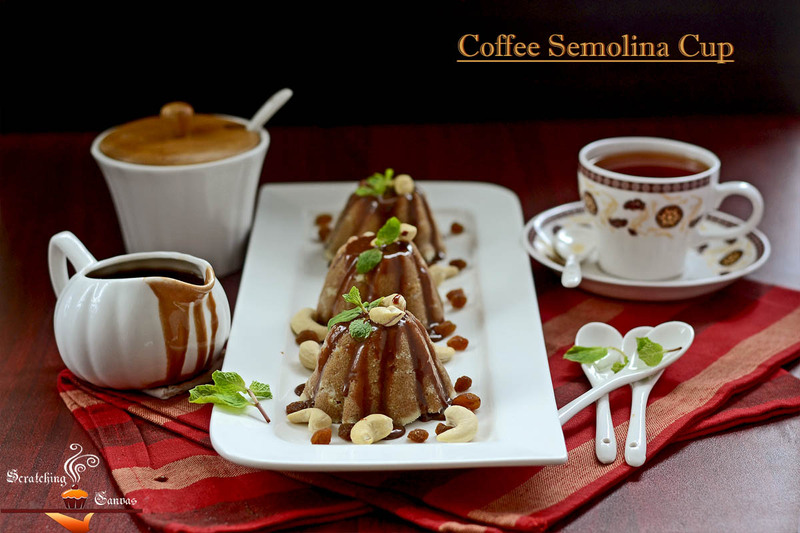 While the coffee semolina cup is cooling, prepare the Ganache or chocolate sauce. 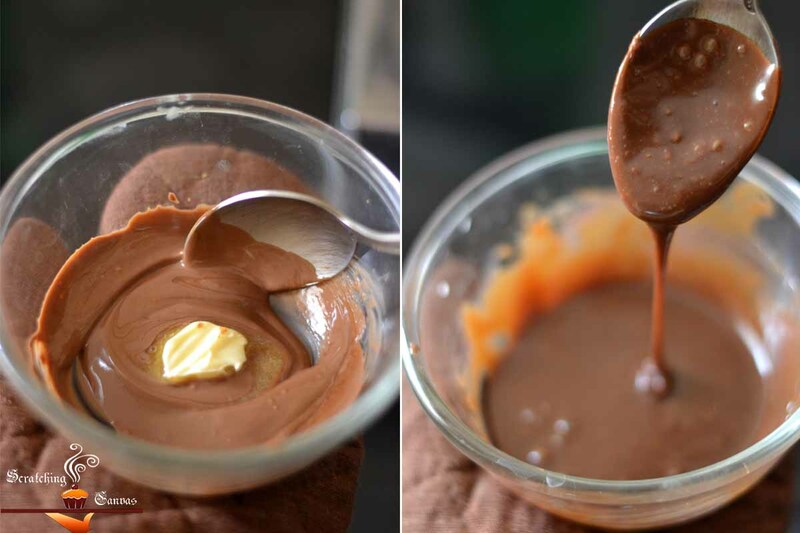 In a mixing bowl add chopped milk chocolates and microwave for 1 min. Add butter in it and beat with a spoon/fork. Chocolate will melt with butter and will be shiny and smooth. 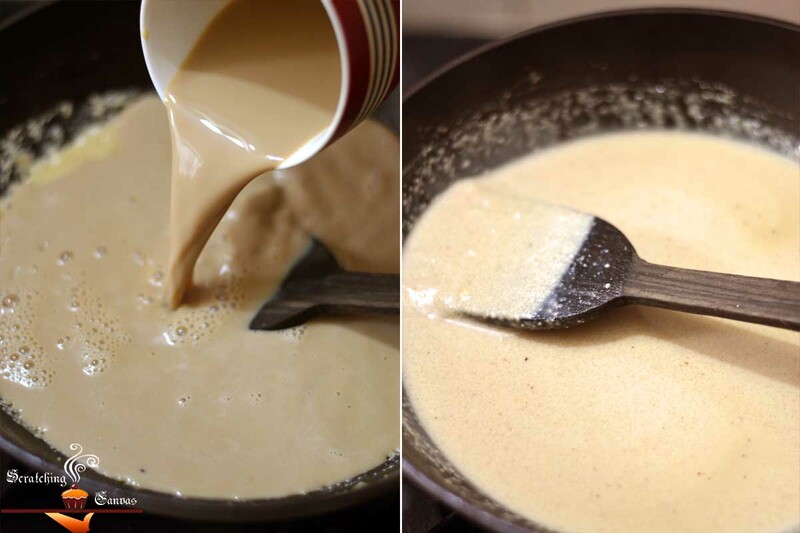 Add milk in it and beat again to make a smooth sauce. The sauce should be able to cover the back of a spoon. Once cups are cooled completely, unmold them carefully. 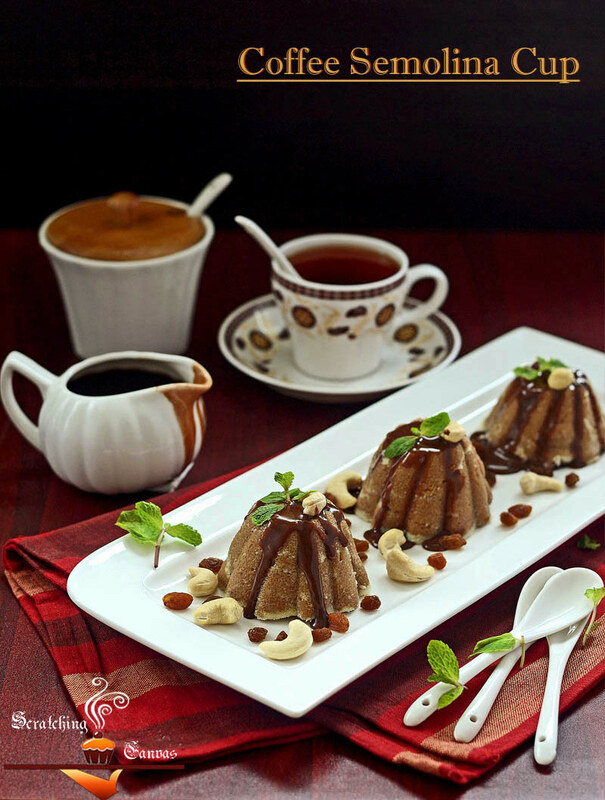 Arrange them on serving plates and pour the chocolate Ganache/sauce on them. 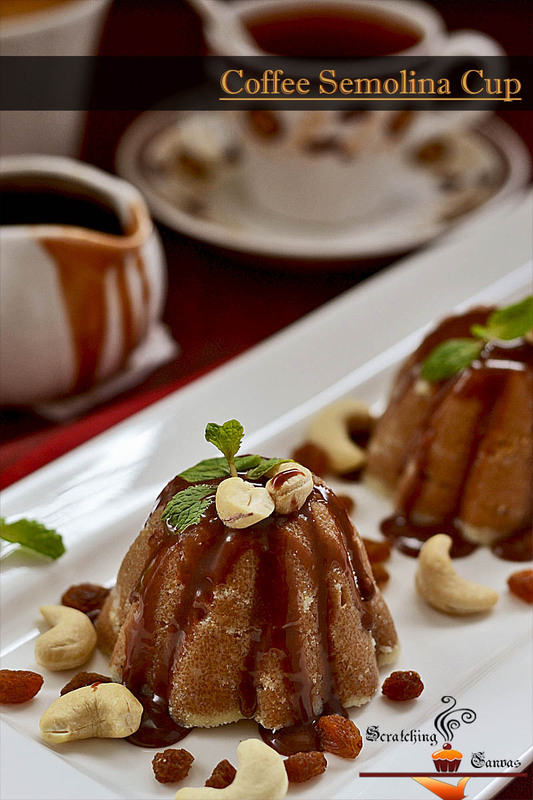 Garnish with cashew, raisins or/and pistachio. Serve chilled or at room temperature. They are extremely delicious in both ways. These cups can be stored for 4-5 days if stored in air tight container and refrigerated. its an innovative thought ..bookmarked.